Tripoley combines the challenge, suspense and fun of Hearts, Poker and Michigan Rummy into a thrilling, friendly game of chance and skill. Up to nine players can play, starting off with a round of hearts, followed by a poker hand, and finally a game of rummy. Tripoley is great fun for all ages and abilities. It helps teach strategy, thinking, memory, and patience. It is an unforgettable game-playing experience. The game is produced by Cadaco, one of America's oldest toy and game companies, and has been a family favorite since 1932. The "Special Edition" version features a custom turntable for easy play, special edition high quality playing cards, special edition gold and silver playing chips, and and easy-to-read instructions. "This game, also known as Tripoli, is a modern version of the ancient European game Poch or . 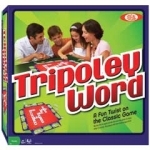 In North America equipment for the game is sold under the name Tripoley." The original rules to the game of Tripoley, as reprinted from a vintage game. Site discussing the game of Tripoley including Tripoley Rules, Tripoley Variations, information about the history of Tripoley and sites of interest.